Have you heard about the group of Mississippi hunters who shot and killed and alligator weighing 910 pounds that was reported to be 185 years old. The story goes that a total of nine (9) musket rifle wounds were found in the huge beast. Several of the 19th. century balls were extracted and analysis on them determined they were fired into the reptile in the mid 1800’s! American alligators have been known to live 50 years or more, and some believe 75-80 years is possible. This unique specimen was estimated to have been 185 years old at the time of its death. Turtles are known to have lifespans of over 150 years, but this is the first alligator ever found to be so old! This story sounds almost to mind-boggling to be true, but it’s plastered all over the internet, so it has to be athentic, right? I mean there’s pictures of the four hunters that killed the massive beast, and also a picture of a man holding one of the 185 year old musket balls. What more proof do you need about the “truth” of an unbelievable story? In doing just a small amount of research on this story I find that it is completely false. Of course there are elements that are true, but the facts are joined with fiction, and a “legend” is born! There were four hunters that killed a very large alligator in Mississippi, but it was closer to 700 pounds not 910! The picture of a man holding a musket ball had nothing to do with the 185 year old alligator story. The 9 old wounds was totally fabricated, as part of a sensationalized story put forth by a magazine that specializes in this kind of head line grabbing news. Nothing but a “spoof” if you will. The old addage “If it sounds to good to be true, but is on the Internet then it has to be true,” is not always the case. You may find that the internet sometimes has it’s own version of the “TRUTH!” Reader beware! Kansas Concealed Carry Without Permit to Join four Other States! Kansas residents would be allowed to carry concealed weapons without permits under a proposed measure endorsed by a majority of state senators. Kansas would join Alaska, Vermont, Wyoming, and Arizona as states that allow residents to carry concealed weapons stateside without a permit, according to the Natioal Rifle Association. The legislation has the full support of the N.R.A. The bill introduces this past Wednesday would eliminate background checks, gun training and other requirements that go along with a permit for concealed carry of firearms, Republican State Senator Terry Bruce said. Kansas already allows open carry without a permit. The bill is co-sponsored by 26 of the 40 senators and must undergo debate in committee before it can be considered in the full Senate and House. Republicans control both chambers which implies that the bill has a good chance to pass. Of course the bill drew criticism from the Brady Campaign to Prevent Gun Violence. Kid Rock has done it again. The “Devil Without a Cause” singer has angered animal lovers by posing with fellow right-wing rocker Ted Nugent alongside a dead cougar, which they killed while hunting. As you might of guessed this has caused an uproar amoung the non-hunting public. 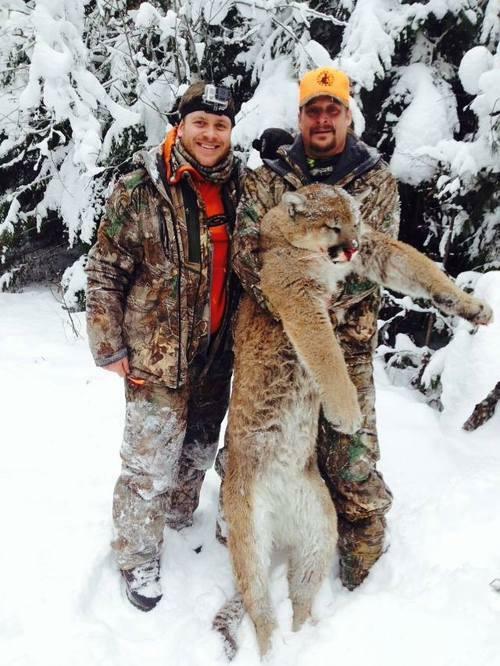 Twitter and Facebook pages have been lambasting the two for their sensless “murder” of this non-edible mountain lion. Note: A friend of mine, who happens to be a chef, just fixed mountain lion last week. Never tasted it myself, but the hunt was legal, fair chase, and approved by the Fish and Game Department. Non-hunters will never understand the ins and outs of hunting, nor can hunters expect them to. Seems now-a-days everything we do ties into being politically correct according to what side of the fence your standing on. What do you (readers) think? Woman Downs Giant Montcalm County Buck! A Montcalm County Michigan huntress has been “grinning” ear to ear after downing “the buck of a lifetime” on November 20th. Valerie Hansen is relatively new to the sport of hunting deer. She has only been at it for 6 years, and it all started when a friend bought her a Hoyt compound bow. She was encouraged to get past the target shooting phase and give deer hunting a try. Her first year in the woods yielded a nice doe. She lamented over that kill for several days, but was “hooked” on the sport. After the doe Valerie shot four bucks with a bow, and was developing a “Let em go-let em grow” mentality that is needed for quality deer management. She planted and maintained food plots on her lease property and also used the “hinge cutting method” on the property borders. Valerie was hunting during the evening of November 20th. when she first saw her “shooter” buck at 70 yards. She was hunting from a stick built ground blind, and maneuvered into position for a shot. The deer was now within 50 yards, but facing away from her. She let out a couple bleats and the big buck turned broadside just like he was supposed to! She squeezed off the shot and the deer only traveled 30 yards before piling up. As she approached her “buck of a lifetime” it sunk in on just how big this monarch was. That’s when “buck fever” kicked into high gear. Valerie’s 11 point buck had an inside spread of 21-5/8. It had 5 inch bases, but due to some palmation going on had almost 7 inches between the G2 and G3’s. The end of the right beam had a few inches broken off and there were some irregularities in tine length, but the Boone and Crockett green score was 167-5/8! Even though this big bruiser was in rut he still dressed out at 180 pounds. That is a lot of good eating deer venison, which Valerie loves. It’s always good to hear about another passionate hunters success story, but I would not be surprised if we hear more from Valerie Hansen in the future. You go girl! You make us all proud. Just a friendly reminder that the 2015 spring turkey applications are due by the end of this month. It’s probably not something your thinking about in the dead of winter, but don’t procrastinate, unless you plan on buying a 234 over the counter license. Even if you don’t apply for any of the “drawings” you can still purchase a license in March for the 234 hunt. Check the DNR website for the exact date the licenses go on sale. About 30% of Michigan’s turkey hunters get their bird each spring, which ranks Michigan number seven (7) in harvested birds in the country. Not bad when less than 100 years ago turkeys were non-existent in our state. Birds purchased from Pennsylvania were used to restock the state and start the turkey success story that we have today. There have not been very many years that I have not put a bird in the freezer. I’ve hunted all over the state including zone’s 1,2,and 3. From the Crystal Falls area to the farm fields of Hillsdale, and even my own back yard. The DNR along with the National Wild Turkey Federation has done a fantastic job of restoring these “game worthy” birds in our state. I can’t wait to call in a lovesick “longbeard” again this spring. Maybe I can finally get one of the grandkids a bird while I’m at it! Details are still a little sketchy about a huge Minnesota buck shot by Chris Warren near Winona Minnesota. The monster whitetail was taken with a bow while still in velvet. The deer had a least 20 scoreable points plus a drop tine. It was taken right around September 19th. of this year. The green score came in at right around 230. This buck will no doubt end up in the top ten largest non-typicals in the Pope and Young record book. This next buck will certainly get your attention as it’s one of the largest non-typical bucks ever to be harvested with a bow. The blessed hunter was Kyle Falck, who arrowed the buck in Decorah Iowa on November 11th. 2014. Kyle had actually seen the buck the day before as he hung a tree stand with a couple of his hunting buddies. The very next day the buck appeared in front of him. Fresh snow and favorable wind conditions put the deer in position for Kyle to draw his Mathews Chill bow and send a G5/T3 broadhead through the vitals. The monster buck only traveled 50 yards as Kyle watched him pile up. The very best I have saved for last. “The Trophy Pursuit Team” actually filmed Joe Franz harvest the largest buck ever caught on camera. Joe shot the buck with his muzzleloader on October 12th. of 2014. The buck had an unbelivable score of 258-7/8 inches making it one of the largest bucks ever taken by a hunter. This buck was also taken in Iowa. It seems like there are a lot of huge deer coming out of Iowa and the surrounding area in the last couple decades. Hope you enjoy the pictures and the unbelivable success of your fellow hunters. It seems that more and more encounters with black bears are making the news of late. Just a few days ago a New Jersey deer hunter shot and killed a small male black bear that was climbing his tree stand. He waited till the bear was three (3) feet away before shooting the bear with his 12 gauge shotgun. The bear reportedly weighed between 85-100 pounds. The New Jersey Department of Environmental Protection found enough evidence at the scene to confirm the hunters account of what happened. He was not charged with any violation of game laws. New Jersey’s bear hunt lasted 6 days, and ended Dec. 13. About 270 black bears were killed in 6 counties. Bear hunting in new Jersey resumed in 2010, and reports of aggressive bear behavior has dropped since then. That does not help heal the pain of the Darsh Patel family, as he was killed by a black bear this past September while hiking with friends. Patel’s death is the only known bear mauling in state history. Just returned from the cabin, and it was quite a trip indeed! We had an inch of snow on the ground when we arrived, and 26 hours later we had 7 inches and more on the way. We had a severe weather alert for most of Northern Michigan, and decided to make a run for it. One of the most harowing trips home ever! Wind driven snow, slick slippery roads, and poor visibility made for some nerve wracking driving! Not to mention the cars, vans, and 4-wheelers sliding off the roads! Half way home we hit sleet and freezing rain, which turned to just rain about 60 miles from home. The normal 3-1/2 hour drive took 5 tense hours. So glad we’re home safely. While we weren’t at the cabin for long, but I did get to check my trail camera’s and fire my 4-wheeler up. There have been a few does and fawns hanging around and one small spike horn. The thing that surprised me was we saw turkey’s all over the place. Every year I have owned the cabin the turkey’s have migrated toward the river swamp. We have never seen any around our place this late in the year. That is a good sign for this old turkey hunter. I did manage to get a couple pictures of 2 hens in my side yard.